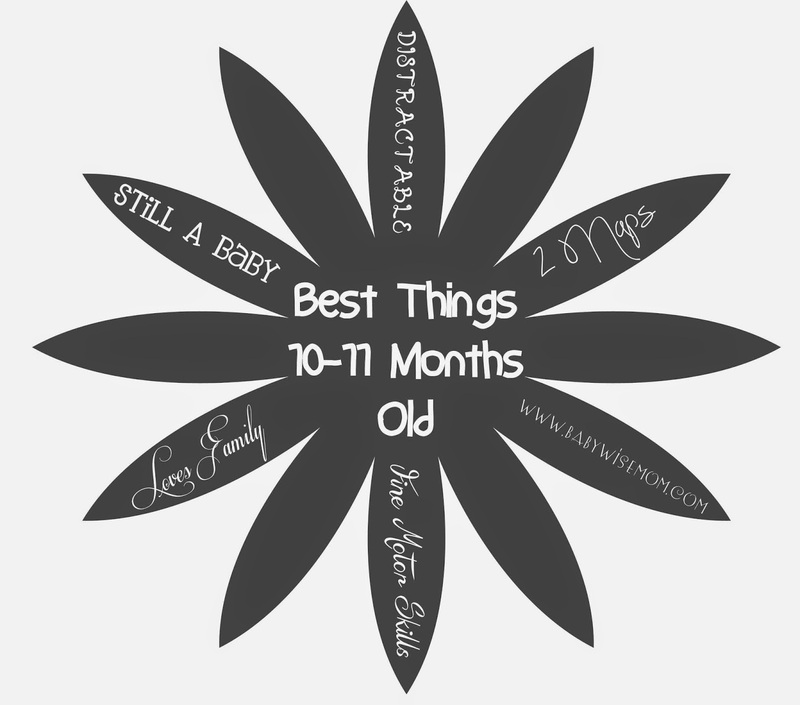 These are some of my favorite things about the 10 and 11 month old. For me, every stage just gets more and more fun. I love the interactive nature of older babies. Love the Family: During this age range, the baby starts to really kind of take note of everyone in the family and how they fit in. She shows special affinity for people other than mom, which for mom can be really nice for little breaks here and there. During this time, McKenna loved to follow her siblings around and just be in the same room with them. Fine Motor Skills: Who doesn’t love the cuteness of a baby’s wave? That look of satisfaction. Those tiny fingers opening and closing. Lots of fine motor skills are continually added. Some come into great control so far as self-feeding goes during this age range. Two Nap Days: Pretty much all babies are down to two naps by now. This really opens life up for the family! Evenings are free to run errands, go to the park, and visit family without worrying about working in baby’s nap somewhere. Gross Motor Skills: Gross motor skills also improve during this time period. Some who weren’t crawling can become quite proficient. Others start cruising or even walking. Interactive With Siblings: Like I said, McKenna loved to follow her siblings around during this age (she still does). This is a range when the child really starts to become interactive with siblings. This of course lasts clear through until perhaps teenage years :). It is so fun to watch your children really enjoy each other as they make each other laugh and play with toys together. If your child is the only child, don’t take this to mean your child will now play with other children. Most won’t. McKenna is far more interactive with other children than babies six months older than she who are only children. That is the nature of the oldest child. But if the child has siblings, she will start to love to play and interact with them. Peek-a-boo is a fun game. And if your baby happens to make a sibling laugh out loud, it will make her life. Mimic: Babies this age mimic like crazy. They try to mimic your facial expressions. It is fun to raise your eyebrows and lower them and watch your baby figure out how to do that. Your baby will also mimic your speech and try to say things you say. If you haven’t already, be careful about what you say and do around your child. She is learning faster than you realize. I am not one who curses at all, nor does my husband. But I say things like “dang it.” It doesn’t sound so bad coming from an adult mouth, but when it comes out of the little 20 month old mouth, it sounds awful! So be mindful of all you say and do. Personality Shines Through: Every day that personality creeps out more and more. This is so fun to watch. You will laugh and laugh throughout each day. Smart: You will watch your babies intelligence emerge. An obvious sign of this is boundary pushing. I know it isn’t fun, but it is a sign that your child is learning and able to figure things out. If your baby isn’t boundary pushing yet, don’t suddenly become concerned that she isn’t smart. And also don’t gloat to yourself about what a fantastic parent you are. All children push boundaries. It will happen. And some do it later than others. Still A Baby: Your baby is doing many things that show how much she is growing up, but in the end, she is still a baby right now, and she only has a couple of months that way. Cherish these baby moments while you can. Those are my top ten! Please do share your favorite things about babies in this age range! Next Post Poll Results: What Book Topic Would You Like To See From Me? I currently have two 10-month olds and we are loving this age! The mimicking is hilarious with twins — it's like they get stuck on a feedback loop!My favorite thing is seeing them really start to PLAY with their toys and figure them out, not just put them in their mouths or pound on them. My baby boy loves to put things in cups, shake them to see what they sound like, and then dump them back out again. My baby girl likes to try to sink her toys in the bath and then watch them pop up. They both love to chase balls around together. I really enjoy these "best things" posts!My DD will be 11 months this week and we've been enjoying all these things 🙂 for now, 1 year can wait! This is a wonderful age and we are about to leave it! Melissa, your twin stories are hilarious! I find that this is the age when I start to really have fun with my kids. Babies are darling and precious, but fun is not the word I would use to describe them… Not as much as the older, more interactive phases. Xander and Nick will now laugh at the same things, like the baby's sense of humor has already almost caught up with my 4YO's. For both my boys, walking happened at this age and it makes them so much happier and more content. It makes a HUGE difference. I'm excited for this stage–we're headed into it.Val-I have a question about independent playtime. When I started it I did it on my son's playmat because he sleeps in his pack n' play (we don't have a crib), but now he is starting to become mobile. I want to continue independent playtime but I'm not sure how to help him differentiate between nap and independent playtime. Could you help me? I have a question. I have a 11 month old and I do love this age, figuring out life and discovering new adventures! Im having a strong issue waking up early. 6 when he is suppose to wake up at 7. I don't feed him till 7 and he has been on the same schedule since 6 months 7,11,3,7. Should I stay consistant with putting him down at 9 for a nap though he did wake early? same with afternoon, if he wakes at 10:30 should I still put him down at 1? Thanks! Manda, he is much smarter than you realize. He will definitely be able to distinguish. For naps, you will do your routine, lay him down, have the room dim…For playtime, you will sit him in it, give him toys, and tell him to have fun playing. If he couldn't see you out the door, you could even leave it open. He will be smart enough to tell the difference. Stacy,Most like, yes, at this age, you should stick with more set nap times.But there will be times he will need to go down sooner, and that is okay too. It is best to follow cues if he has them, but at this older age, you really want naps to happen at the same time each day. Can anyone help!?! I have used babywise since day 1 with my son and we have always had a problem with 45 minute naps. I leave him to fall back to sleep but he dosent. Now he is 10months old and his morning nap is 45 mins he usually takes an hour &15 min afternoon nap and then needs another nap around 5pm and goes to bed at 8pm. He sleeps perfectly at night but I am lost about what to do with his naps. Thank you! I would say either waketime length is not correct (should be about two hours up before the first and second naps) or there is something waking him up. If you live in a noisy neighborhood or your house is not quiet, I would do some sort of sound machine.